With the focus on screens and scores, this bar stocks a wide selection of microbrews and traditional beverages. Sport Book & Bar is conveniently located next to the stimulating atmosphere of our Race & Sports Book. Place your wager and feel the energy of being in the epicenter of adrenaline. Sport Book & Bar features state-of-the-art TVs for the ultimate in precision viewing. Located at the Race & Sports Book. Follow the main walkway towards the Casino. 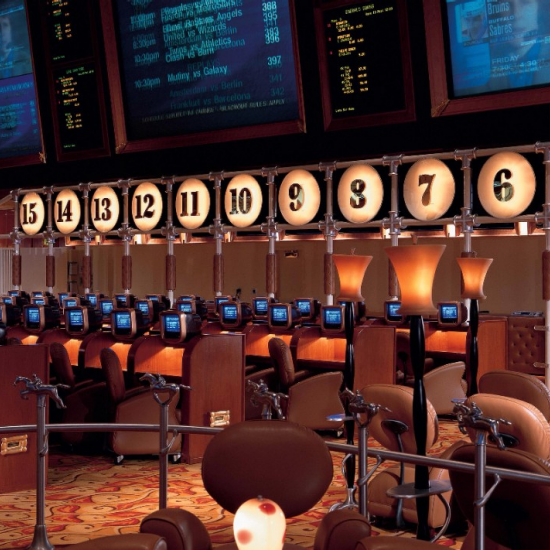 Once you have entered the Casino keep right and Sport Book & Bar will be on your right-hand side following Snacks. Enter the Casino and stay on the main walkway until you reach a crossroad. Veer right and turn left once you've reached the Casino Cashier. You will pass Lily Lounge on your left-hand side, and the Sport Book & Bar will be straight down the walkway. Partake in this stylish, sleek atmosphere while listening to classic jazz sounds to make your night come alive—in the way only Bellagio can. At the Baccarat Bar, our juices are hand-squeezed daily for the freshest cocktail experience in Las Vegas.